These brown sugar shortbread cookies turn up every year during the holidays at my family house. I can’t say where the recipe originated from, because I honestly don’t know; my mother has it scribbled in her nearly-undecipherable spidery doctor-lady handwriting in a tattered old recipe book that I’m pretty sure is older than I am. They are so simple, containing only three ingredients; butter, brown sugar, and flour. And they are so good. Buttery and caramelly, they aren’t a dainty, melt-in-your-mouth shortbread cookie. This is a solid shortbread cookie. A tough shortbread cookie. I imagine that if loggers baked cookies, they would bake these brown sugar shortbread. This year I decided to try making them with white whole wheat flour, and wouldn’t ya know, they came out just great. 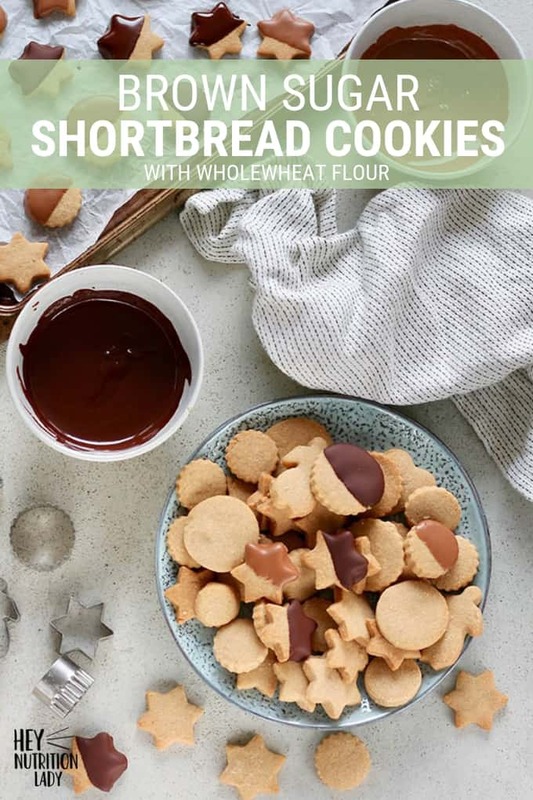 You could definitely stay true to the original recipe and use all-purpose as well, but if you’re looking for a whole wheat shortbread cookie that doesn’t taste like sawdusty health-food, here you go. 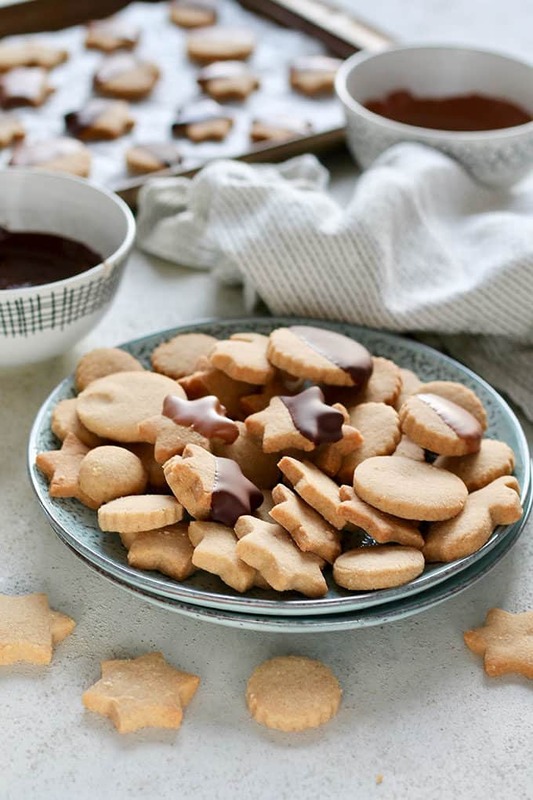 What goes into these brown sugar shortbread cookies? Butter. We’ll talk about that in a sec. Brown sugar. Light brown sugar is best in this recipe. Flour. While whole wheat flour and all-purpose are both fine. So, butter. Baking purists will always tell you to choose unsalted butter, but I want you to know that I use salted butter in approximately 100% of the baking I do. I do this because I am a) lazy, and can’t be bothered to make a trip to the store for unsalted butter when I have salted butter in my fridge all the dang time, and b) cheap. I hear by give you permission to use salted butter in your baking, too. Live dangerously, my friends. Be butter rebels. Really, do what you will in the butter department, but if you’re going with unsalted butter you may want to add a pinch of salt to this recipe. 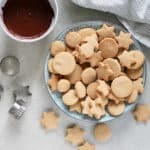 How do you make brown sugar shortbread cookies? 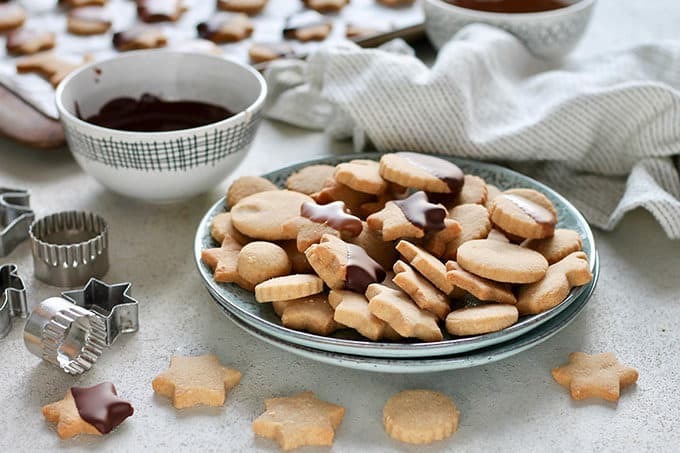 These are literally the easiest cookies you’ll ever make. Li-te-ra-lly. So easy it’ll make you punch a wall when you think about all the time you’ve spent making complicated cookies. You need to start with room-temperature butter, so you’ll either want to plan in advance and leave your butter sitting out to soften, or microwave it in very short bursts to get it to the right texture. As we know, I like to live dangerously, so I often use the microwave technique. Then, either using a stand mixer or an electric hand mixer, cream the butter and sugar together. You don’t need to go for light and fluffy here, just get it mixed. Add the flour, and mix it all in. Don’t fret if it seems like a crumbly mess; this is correct. The warmth of your fingers will bring the dough together into a cohesive mound that is easy to roll out, and doesn’t require any refrigeration beforehand. The trick to these cookies is rolling them out to just the right thinness; too thin and they’ll burn, too thick and they won’t cook properly. I’m going to say that around 1/4 inch thick is what you’re going for. Do I need to use unsalted butter? Salted and unsalted are both fine. I use salted, so if you’re using unsalted be sure to add a pinch of salt to the recipe. What temperature should the butter be? It should be room temperature for easy mixing. If you didn’t plan ahead, just carefully soften your butter in the microwave in short bursts. What kind of sugar do you use? Light brown sugar, please and thank you. Don’t have brown sugar? Make your own! What kind of flour do you use? 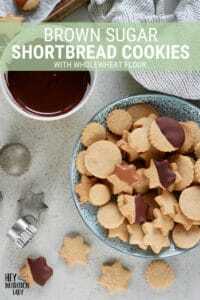 I’ve made these cookies with both all-purpose flour and white whole wheat flour. Both yield great results. Can I make the dough in advance? Yup! Make it, wrap it up in plastic wrap, and chill it in the fridge for a few days. Or keep it in the freezer well-wrapped for up to three months. Be sure to let it come to room temperature before you try to roll it out. Can I make the cookies in advance? You bet! They’ll last about a week in an air-tight container at room temperature, or you can keep them in the freezer for about three months. Pro tip! 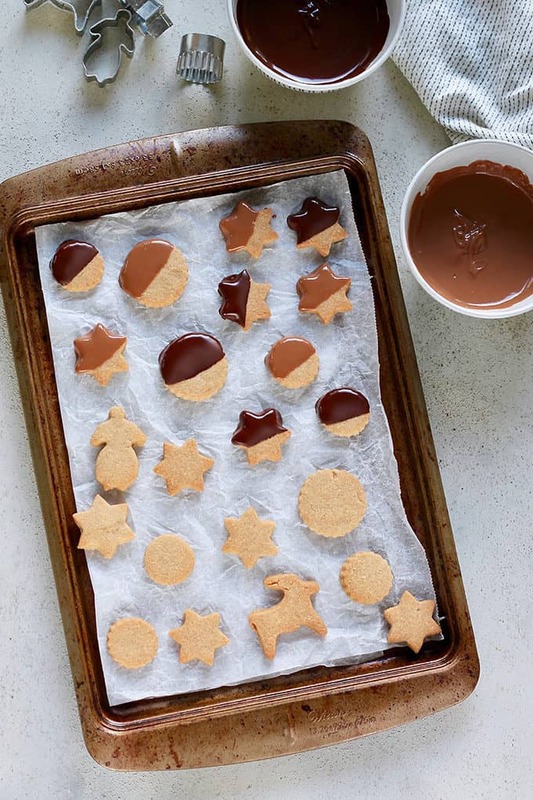 Frozen cookies are way easier to dip in chocolate because it firms up super fast. Hey Nutrition Lady, what’s the deal with white whole wheat flour? Here’s the deal: regular whole wheat flour and all-purpose flour are typically milled from hard red wheat berries. Whole wheat flour contains the entire berry (bran, germ, and endosperm) while all-purpose flour has had the bran and germ removed and contains the endosperm only. White whole wheat flour is milled from hard white wheat berries, and much like regular whole wheat flour, contains all three components of the wheat berry. The bran of the hard white wheat berry yields a lighter coloured, more tender, and sweeter-tasting flour, which is perfect for making baked goods that you want to be on the healthier side without tasting like a brick of bran. Whole wheat pastry flour is made from soft white wheat berries, and is more tender with a lower gluten content than the hard wheat varietals. Preheat oven to 350°F / 180°C. Line a large baking sheet with parchment paper. With a stand mixer or an electric hand mixer, mix brown sugar and butter together until well blended, and slightly fluffy. Mix in the flour, careful not to make a terrible mess with the mixer. Turn the dough out onto a clean counter top, and bring it together into a disc with your hands. On a slightly floured surface, roll the dough out to about 1/2 inch thick. 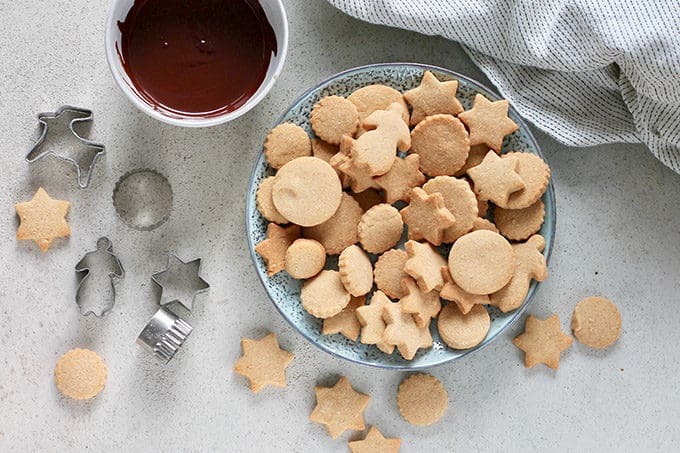 Using a cookie cutter, cut into shapes, and transfer carefully to prepared baking sheet, leaving a little space between cookies. The dough can be re-rolled and cut out again as needed. Place the cookies into oven and bake for 10 - 12 min. Cookies are done when they are very lightly golden brown. Transfer the cookies to cool on a wire rack. Dip into melted chocolate if desired! Nutrition values are an estimate only, and will vary depending on the size of the cookie cutter you use. Yield will vary depending on the size of the cookie cutter you use. Can I make the cookies in advance? You bet! They'll last about a week in an air-tight container at room temperature, or you can keep them in the freezer for about three months. This recipe was originally published December 23, 2010. It was retested, rephotographed, and updated on December 18, 2018. Hi Katie: I have been baking these for years and I agree with you, they are the best. 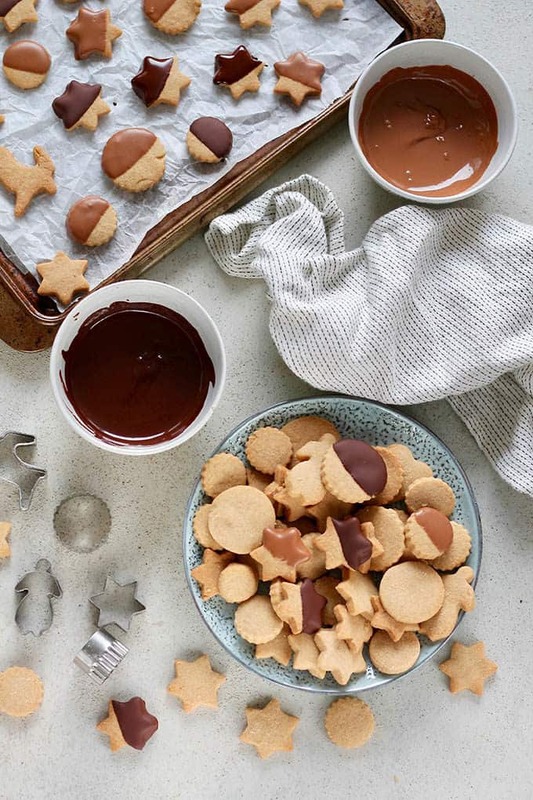 I tend to dip them in some dark chocolate, not the whole cookie – not more than half. I bought a mitten cookie cutter this year, small and dipped the cuff in it. You go girl!!! Have a great holiday, my best to “That Man”. Jeebus, woman, just schedule posts already. We have enough dark here without seeing your glorious, sun-filled posts. But enjoy :> I’ll make these tomorrow. Don’t forget I just returned from the land of 2:30pm sunsets. These sunny days are well deserved. The way you use language is so devastatingly lovely that I’ve subscribed. Also, I love shortbread. I make it all the stinkin’ time. I never *once* thought of using brown sugar. Now I’m pretty much obliged to try it. Thanks! Thanks for the wonderful comment! Welcome! Wow, these look great and so simple (a bit like the Costa Rican lifestyle perhaps?). Finally got around to making these… it’s that time of year again. Yummy, now i just need to try that chocolate drizzle you mentioned. I love these cookies! Pretty sure I’ll need to make another batch this weekend for giving away, the ones we made last weekend are nearly gone! Made these just now and they came out really well. Added about 1-2 t cinnamon for fun and put colored sprinkles on before baking. Thanks for the recipe! Glad you enjoyed them! It’s one of my favourite recipes. Hey Rachel! I usually melt a chopped up bar of dark chocolate. I used Lindt bars here and they worked great. One was 70% and the other was a regular milk chocolate bar. I’ve also used white chocolate before and it’s delicious! I melt my chocolate in the microwave in short-ish bursts (30 seconds at a time) to avoid burning it. You got this! I started making these last year. They are a permanent part of my Christmas cookie regime now. Many thanks!! Enjoy your first Christmas as four. They bring a magic to Christmas.